"A Century of Service 100 Years of The National Exchange Club". Picture filled historical account of the past 100 years. 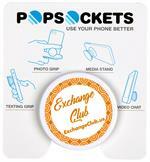 A great gift idea - Celebrate Exchange Club's 100th birthday. 11 oz. Cobalt Blue C-handle Coffee Mug. Exchange emblem on front; Established 1911 and URL on back. Gold imprint is microwave and dishwasher safe. 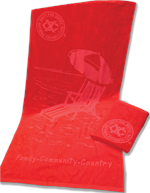 Red 30” x 60” velvety soft 100% cotton, double-sheared terry cloth beach towel. Translucent tone-on-tone imprint. 9" Multi-colored balloons with black emblem imprint. 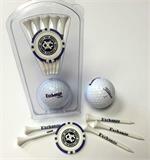 Golf Accessory Set includes 1 Titleist Ball, 5 Tees & a marker. 1/2” blue cotton lanyard features EXCHANGE CLUB repeating imprint with special O-ring attachment for pin-on or clip-on name badges. A great gift idea for A.C.E. and Youth scholarship winners, award recipients, and guest speakers. Red with debossed Exchange Emblem on front cover. 8.25”h x 5.75”w. Soft faux leather cover. 80 ruled pages, elastic loop closure and bookmark. Black pen with gold trim featuring Exchange emblem, blue ink; handsomely gift boxed. 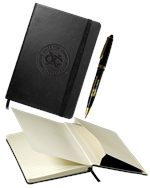 Black pen and pencil set with gold trim featuring Exchange emblem, blue ink; handsomely gift boxed.